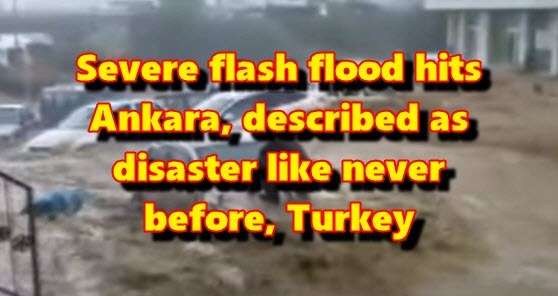 Heavy rainfall caused severe flash floods in Turkey's capital Ankara on Saturday, May 5, 2018. More than 160 vehicles were swept away and at least 4 people injured. "It was a disaster like never before," Ankara's Mayor said. Fast-moving floodwaters swept away around 164 vehicles and numerous large trash cans in Ankara's Mamak district, after rain that was expected to last three hours had fallen intensely in just 9 minutes. Dozens of homes and businesses were severely damaged, officials said. "Four people have been injured and three of them are being treated at a hospital. The health condition of the injured is not serious," Labor and Social Security Minister Julide Sarieroglu said. One of the videos showed a man desperately sitting on top of his car, while the flood washed away several vehicles in Mamak's Boğaziçi neighborhood. He was later rescued. Featured image: Flash floods hit Turkey's capital Ankara on May 5, 2018.